Daphne Lundi is a flood resilience and neighborhood planner in the Brooklyn Office of the Department of City Planning. I manage and review projects in coastal neighborhoods to ensure new developments are meeting the latest resilient construction standards. I also work on community engagement programs to increase education around flood risk and climate change. In addition to my resiliency work, I also work on a range of housing and commercial development projects in Brooklyn. 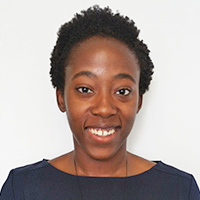 I’ve also worked on environmental planning projects in Haiti for, a planning firm started by Vanessa Léon, a Haitian American planner, in response to the 2010 earthquake. I helped to support a participatory planning effort in Petit Goâve, Haiti. A lot of the work centered on community-led mapping efforts to map community resources and areas at risk of erosion. Prior, I was a community planner at the Federal Emergency Management Agency where I worked on recovery plans post Hurricane Sandy for small townships in Suffolk County, New York. My work increases resilience on different scales. On the macro/built environment scale, my work involves ensuring that zoning and land use regulations encourage and facilitate flood resilient construction and retrofitting. On the personal/micro scale, my work is helping residents understand their risk from flooding events and helping them understand future risk from climate risk so they’re equipped to make the best decisions and be personally resilient. I've always been acutely aware of the way environmental conditions can impact the quality of life because my family is from Haiti, a country that experiences regular hurricanes and has a history of deforestation. When I went to planning school, I knew I wanted to broadly focus on environmental planning, particularly the in Latin America/Caribbean context. After Hurricane Sandy in 2012, my work shifted to flood resilience in the New York City context, but there actually are a lot of similarities in the challenges faced by countries in the Caribbean and coastal communities in the U.S. I think being an active listener and good translator are essential skills for being a good planner. I grew in an immigrant household and a lot of my early life involved translating things to the rest of my family. I use that same skill set in the work I do as a planner. Climate, resiliency, zoning, are all very technical concepts, and it’s up to us as planners to break down these concepts and make sure they are relevant and contextualized for the everyday citizen. You shouldn’t need a master’s degree to understand how and why climate change or zoning is relevant to your life. I also believe deeply in being a lifelong learner, with a field like flood resiliency, there’s a lot of new data and best practices that are coming out, I try my best to keep up to date on the latest literature. It’s usually a mix of meetings and project management. I typically work on a variety of projects at any given time, from neighborhood studies to site-specific developments. I’m also a liaison to several community boards in Brooklyn, so I often answer general zoning or building code questions. I also do a lot of community outreach, going to community board and civic groups to provide updates on resiliency policy or general land use and zoning policy. As a Brooklyn native, I feel really lucky and privileged to get to work on projects in Brooklyn and be involved in shaping the built environment. I get to give back to my hometown and work on projects that improve resiliency, support affordable housing efforts, and improve urban design and public realm for a range of communities. It’s also helped me rediscover parts of the city with a whole new lens as an urban planner. I’ve also tried to use my platform as a way to encourage more people of color to enter the urban planning and design profession. Planning is still a predominately white profession, and many people don’t even know it’s a career option. I always jump on the opportunity to be involved in career days and planning workshops with young people, in the hopes it inspires more people to get involved in civics and shaping the built environment. How much urban design related work I get to be involved in. When I was in grad school, my focus was primarily on sustainability and resiliency, but I’ve gotten to work on projects heavily centered on urban design that have broadened my own understanding about the importance of public realm and streetscape. I’ve seen first hand the transformative power of good urban design that centers the human scale and encourages social engagement in public space. Get involved in local civic groups and community groups. It’s a great way to learn about local politics and local urban planning issues. Take classes in geography, climate science, and sustainability. Having a creative outlet is essential for me. Working in government can sometimes get wonky — having a creative outlet where I can work on things completely different from planning is really reinvigorating. Also working on urban planning issues outside of my day-to-day work has also been helpful in broadening my understanding as an urban planner. As a youth engagement coordinator with the NY Metro Chapter Diversity Committee, I've gotten to introduce a lot of young people to urban planning. Young people have such unique insights and perspectives on cities and the built environment in general. I always learn something new when I talk to a young person. I also deeply believe in creating spaces of collaboration and coalition-building. I’m a part of BlackSpace, a collective of young, black urbanists working in New York City and we’re constantly learning, and sharing ideas with each other on the built environment and ways of working differently in urban planning and design. Shirley Chisholm is probably who I look up to the most in terms of public service. A lot of her work centered on amplifying the voice of marginalized communities and she paved the way for women and in particular, women of color, in politics and government. In NYC government, I’ve also had the great pleasure of working with really inspiring and innovative urbanists like Justin Garrett Moore. Environmental Planning Consultant for Pinchina Consulting.